Education has always played a key role in the ISSA Convention and this year’s event is no different. The Commercial Business Solutions track provides a comprehensive business-building series for building service contractors. Among the seminars offered are those on finding talent, preventing workplace illnesses and absenteeism, Internet of Things technology, marketing, and workloading. Also of note for BSCs is the Healthcare Environmental Essentials track, which provides an intensive educational program for those with a special interest in safeguarding healthcare environments. Included are seminars on infection prevention and control, disinfection and decontamination, and others of relevance to those in this arena. For those BSCs responsible for cleaning educational facilities, the Green Clean Schools track is presented by the Healthy Schools Campaign and ISSA. Some of the seminars available include taking stock of green cleaning programs in schools, cost savings, green cleaning equipment and supplies, identifying green cleaning products, and adopting green cleaning training and procedures. ISSA has assembled quite a roster of keynote speakers. 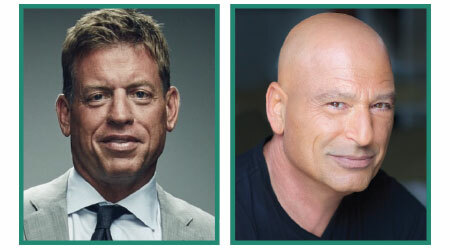 First up is football great Troy Aikman, tapped to deliver the keynote address, entitled “A Winning Playbook,” on Wednesday, Sept. 13, at 9 a.m. Aikman’s exploits on the football field as quarterback for the Dallas Cowboys were legendary. He spent a spectacular 12 seasons with the Cowboys, leading them to six divisional titles, four conference championship games, and three Super Bowl wins — one of only four NFL quarterbacks who have managed such an accomplishment. Along the way he managed to set 45 franchise passing records and was named MVP of Super Bowl XXVII. Aikman is now the lead NFL analyst with FOX. The hilarious and witty Howie Mandel will close the show on Thursday, Sept. 14, at 2:30 p.m. Mandel will first sit down for a Q&A session with ISSA Executive Director John Barrett before delivering a stand-up comedy routine. The performer is one of the most versatile forces in show business, with a career spanning more than 30 years. Now in his eighth season as a judge on “America’s Got Talent,” Mandel also has a serious side, in 2009 authoring a best-selling memoir, “Here’s the Deal: Don’t Touch Me,” that unsparingly details, with frank and funny humor, his continuing struggles with OCD and ADHA and how these conditions have helped shaped his life, career and comedic genius. But that’s not all. Also taking place on Thursday at 9 a.m., is the State of the Economy panel discussion, composed of four members that are outstanding in their fields. Moderating the discussion is Frank Luntz, described by David Frost as “the Nostradamus of pollsters.” He is recognized and honored worldwide for his business acumen and predictive accuracy. Panelists include Brian Beaulieu, who has presented workshops and economic analysis seminars in more than seven countries and who assists organizations and companies in planning and forecasting; Jim Messina, who served as President Barack Obama’s chief of staff and masterminded his 2012 re-election campaign and who now heads up the Messina Group, which provides strategic consulting services; and Karl Rove, a Republican political consultant and policy advisor, author and frequent guest/commentator on the Fox News Channel, who is most known for his roles as senior advisor to President George W. Bush from 2000 to 2007 and deputy chief of staff from 2004 to 2007. Speaking of panels, the final day of the show features a series of panels looking at the future of different cleaning industry segments, including contractors, distributors, residential cleaners and in-house facility providers. The State Of The Industry Building Service Contractors Panel takes place at 10:30 a.m., at the ISSA Education Theater, Booth 129. Panel members include Jim Harris Jr., Rachel Sanchez, Taylor Bruce and Matt Vonachen.